The veteran Labour MP Paul Flynn has died at the age of 84. Mr Flynn, who was first elected to represent Newport West in 1987, had been ill for some time. Labour leader Jeremy Corbyn said Mr Flynn was an independent thinker who was a credit to the party. Wales’ First Minister Mark Drakeford called him a “giant of the Welsh Labour movement”. Newport West Labour Party confirmed in a tweet that Mr Flynn died on Sunday, saying he was “a hero to many of us”. Mr Flynn announced in October he would step down from Parliament “as soon as possible” after becoming confined to bed because of rheumatoid arthritis. I’m very sad at the passing of my good friend Paul Flynn. He had such love for Newport, knowledge of radical South Wales history and a dry wit. He was an independent thinker who was a credit to the Labour Party. He will be greatly missed. Welsh Labour leader Mr Drakeford said: “He was one of the most effective communicators of his generation – inside the House of Commons and outside. Mr Drakeford said it had been “a privilege to have worked with him, in the run-up to the devolution era and beyond”. Announcing his intention to quit politics, Mr Flynn said he was very frustrated not to be taking an active role after three decades. The veteran MP campaigned on a wide-range of issues, including benefits, animal welfare and devolution. 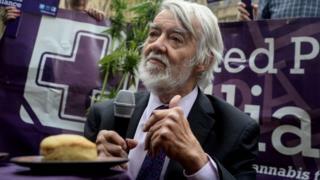 He campaigned for cannabis to be legalised for medicinal use, and in 2017 called for users to come to Parliament to break the law. A career backbencher, upheaval in the Labour party saw the MP briefly serve on the opposition front-bench in 2016. Jayne Bryant, the Welsh assembly member for Mr Flynn’s constituency, first met the MP when she was nine years old. “He brought politics alive to me then and has done so ever since,” she said. Welsh Secretary Alun Cairns said Mr Flynn was an “exceptional constituency MP”. Conservative Welsh Secretary Alun Cairns said Mr Flynn was an “exceptional constituency MP”, and said it was a “privilege to work with him”. Mr Flynn’s party colleagues paid tribute to Mr Flynn on Twitter when the news broke late on Sunday night. Cardiff West MP Kevin Brennan said Mr Flynn was a “passionate pursuer of justice for the least well off”. “We’ve lost someone who put his values and his beliefs at the heart of everything he said and did,” wrote Blaenau Gwent AM Alun Davies. Jo Stevens, the Cardiff Central MP, said Mr Flynn was a “kind, principled, fascinating man who was devoted to his constituents”.